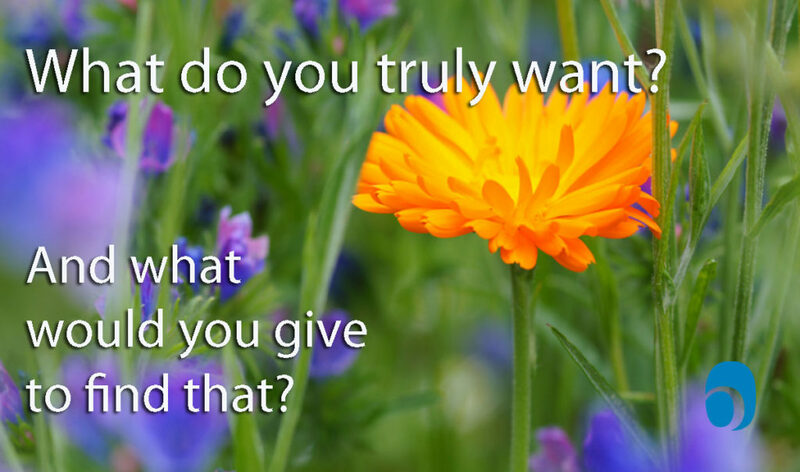 What do you truly want? And what would you give to find that? What if you had a roadmap, a process, to put your emotional intelligence into service of that goal? Emotional intelligence is a resource we all have, but it’s hard to use this capability without a process, a roadmap. In the Six Seconds Model of Emotional Intelligence, there are three “pursuits” forming a process framework that enables people to be more effective by tapping the power and wisdom of feelings. The first two pursuits are reasonably straightforward, albeit enormously challenging to accomplish consistently. The third is a paradox that many find contradictory… yet it’s what makes the model transformational. Know Yourself means tuning into our own feelings and behaviors, and seeing the links between our feelings, thoughts, and actions. This requires a mindfulness and compassionately honest self reflection that’s extremely rare in a fast-paced world. Choose Yourself means pausing to evaluate the data gathered from “Know Yourself,” and shifting from “reaction” to “response.” To show up intentionally requires a delicate balance of self-discipline and self-acceptance — being our real selves honestly, and also being better each day. Give Yourself means ensuring that your awareness and choices are in service of your own purpose, and supporting others to do the same. To live purposefully, to use the moments of our lives carefully, requires us to FEEL our sense of purpose, and to empathically connect with the world around us. We can all USE emotional intelligence — not just have it tucked inside! Here is how. To some, the third pursuit sounds like weakness, but it’s actually the more powerful. It’s a kind of super-charger on the engine of the model — it moves Six Seconds EQ from “nice to have” to “need to have.” We call the third pursuit “Give Yourself,” and it’s about serving your purpose. In the first two pursuits, we build awareness and then create intentional responses. But what are we using that awareness and intention for? In Give Yourself we ensure our steps are actually going someplace worthwhile. It’s about connecting with others and the larger world, finding unique purpose and serving it. Sometimes people react to the term “Give Yourself” because it might sound “too nice,” but actually it’s an intensely practical process. The reality is that without this, we rarely get what we want; we wear armor that is an illusion of protection that only serves to isolate us. Give Yourself is the way we get what we actually want instead of simply exercising the hedonic treadmill, endlessly pouring our lives into a bottomless pit of self-gratification or chasing external validation. The central paradox is that when we are “taking” and “protecting” or even “striving” and “winning,” we usually get the opposite of what we truly want; but when we give, we get. This principle defies the carefully constructed economists logic used to drive markets and industries and nations vying for dominance — yet it’s no less true. When we’re focused on taking, we never have enough, we are never enough, and we are profoundly alone. When we are giving there is abundance, we are more than enough (which is why we can give), and we are deeply connected. When focused on taking or accumulating, there is never enough. New view needed. Seth Godin recently wrote about this paradox and how the web actually amplifies the results of “Giving Yourself” (and of taking) — he calls Philanthropists the ones who give more, and Bandits the ones who take more: The fascinating thing for me is how much more successful and happy the philanthropists are. It turns out that when you make the world smaller, you get to keep more of what you’ve got, but you end up earning a lot less (respect, connections, revenue) at the same time. Does this match your experience? Are those who focus on taking for themselves, in the end, less connected, less whole, less happy? Does the attitude and action of genuine giving somehow unlock a sense of belonging and feeling of place in a larger world? Those who give more are happier. And wealthier? Check the research. If that’s not enough, it turns our this commitment will also get you ahead in your career. 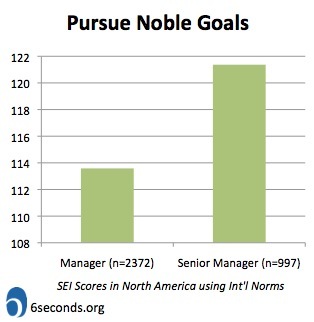 New research we’re analyzing now, looking at over 27,000 individuals globally in terms of emotional intelligence scores: Generally, more senior leaders have higher EQ (this is not a surprise since EQ is predictive of career success — hired for IQ, promoted for EQ). The surprise, perhaps, is that the single EQ competency with the greatest gap is in Give Yourself, specifically the capability to Pursue Noble Goals. In fact, those in the top band of the competency are almost twice as likely to be in the most senior organizational roles. There is an element of giving that’s about generosity, an element about self-fulfillment… there is also a significant component of empathy. When we emotionally connect with others, we recognize a fundamental shared humanity — we know we’re all in the same lifeboat. It’s this connection that links giving to both happiness and performance. In a fascinating TED talk (video is below), Michael Norton discusses a number of studies on the finance of happiness. You CAN buy happiness, he asserts — it’s just not the type of transaction most of us imagine when we here that phrase. The paradox of giving. While many people will accept this “give to get” notion in their private lives (or at least in a church/temple/mosque), it seems to be a huge leap for modern entrepreneurs to see the value. Yet some companies attract and retain great talent because their work matters. Others have created a culture of mutual win that supports excellence — in Norton’s research, when an individual is given a €15 incentive for himself, the company generates €4.5 in value (a lost of over €10)… but when he’s given €15 to give to the benefit of others, the company returns a massive €78 in value (a 520% ROI). Imagine creating a climate of giving in your company — a culture where people genuinely, spontaneously, and regularly exercise generosity! Those who give of themselves, those who serve a compelling purpose, are happier and are more often in senior positions. They motivate others and build economic as well as social value. So how do we integrate that into our lives? Do we need to accumulate wealth so we can give it? While people and companies frequently say they need to “do well in order to do good,” it turns out that actual abundance is probably not the source of giving. While we might expect those who are well off to be more empathic and generous, some research suggests the opposite. It is true that very wealthy give extensively (and the largest philanthropic donations do come from some fabulously wealthy patrons) there are many studies indicating that in proportion to their means, those with less actually give more. Do you have to *do well* BEFORE you *do good*? Both at once? What, then, is required? Having more doesn’t seem to be the answer — instead we need to teach people to connect to their own and others’ emotions. What awareness and skills can we build that allow people to transcend ego and connect with their larger vision? And, especially to do so when they’re in times of stress and challenge? Perhaps one reason the Six Seconds Model is so powerful is that it provides a process to shift toward this way of engaging — to align what we’re doing and how we’re responding to our own most significant goals. What if we could align our daily actions with our highest goals? This is an amazing write up. And Melodiously dipicted and presented. This reminds me the poem in marathi, my mother toungue. A very simple poem. It says that, “DENARYANE DET JAVE, GHENARYANE GHET JAVE, GHETA GHETA EK DIWAS GHENARYACHE HATaCH GHYAVE.” I will try to translate it, “Denaryane = the doner should keep giving, and ghenaryane = the taker should keep taking, But one day, gheta gheta = while taking taker should take hands of a doner, hands as a symbolically, a taker should take actually the act of giving from the giver.” the poet writes hands for it. Wow! what a poem!! If all takers take this act of giving from givers the whole world will look totally different. Why the giver gives? May be the one who gives sometimes, he gives for giving to get. but the giver who gives always, I think for sheer joy, and happiness. To enjoy the process and to spread around. My noble goal is taking shape in my mind, would be connecting to the giving and spreading happiness, once I decide about it would surely share. Or may share to decide about it. The Video clip is just awesome. Wow! Thanks for sharing. Hi Arati – I appreciate you sharing here. 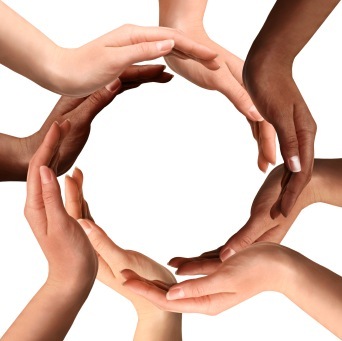 When we give and receive, we join hands – yes? In a sense there is a connection whichever role you play, both are needed to form the connection. As a metaphor: If we try to give, or try to receive — but we don’t connect — the gift falls to the floor. I can see this same metaphor in terms of leadership and followership, if the hands don’t join, the chain breaks. Hi! Josh, Thank you for your reply. I deeply believe in connection. So I took it for granted that the chain is alive. But Your point is valid too. I don’t see anything e.g. reaching towards noble goal or achieving the purpose or finding fulfillment in the success without proper connection. Connection with people who believe in this process, and who begin this process is the main crux. And untill we reach out to people we may not understand who do believe in this process and whom are in need of this connection? So Noble Goal can be the answer again on this. And the chain revolves again like the pic of hands are shown in the above article. It is Melodious with all other things rythm can be added to it too! The other day I saw my kid sitting on the facebook even when it was sleeping time, I said I want to sleep too but I would like to wait for you, I didn’t ask what is the kid doing whether facebook or whatelse, but when I said that, my kid said, oh! I will do it later, let us go to sleep. I think connection begins the change process. Connection brings about many important emotions too! as Caring etc. Thank you for this important and valid point of connection!! It has been a challenging model to me since I decided to put it in practice a few years (a work in progress). To me give yourself is about giving yourself to you(rself). This brings a sense of fulfilment and it comes from the action, from the giving process. Giving is about generosity,when one gives, one’s rich. It’s not about money or stuff it’s giving what matters, what is precious, what is needed (hence the richness). It’s finding out how to give yourself to you, through yourself. Human beings are different from themselves that’s how they evolve or else there would be nothing new to know about themselves. They come face to face with someone else, someone different, everyday and that’s how one can give yourself through others. Self-knowledge is a gift itself it’s only natural to pour out to others around. Essentially E.Q.is a coming through process that helps people to come along. It’s how I feel. Hi Maria – great point: When we give ourselves to purpose, to the world, we’re also giving ourselves to ourselves. In the “Give Yourself” part of our model, one competency is Increase Empathy. I often ask coaching clients who are skilled in this area: Are you using this toward yourself as well? When we shift to this state of abundance and connection, our emotional experience transforms — our sphere of concerns expands… as does our sphere of influence! Exactly Josh. That’s what I’m working on now. Thank you. Of course, the above was quoted just before the act of tithing. So, for a longtime, “giving myself” always meant money to me. On the other hand, “giving myself” in the secular world meant being pulled yet again in all different directions, much less time for my daily reflection (for being an introvert, I need lots of quiet time and meditation), and a drain on my energy. So, in this context, I steered clear away from “giving myself” like the Black Plague! At work, I didn’t consider the idea of “giving myself” since, after all, I get paid. Now that I am getting older, hopefully wiser, I have had a change of mind. I like to think that my study of EI over the years had something to do with it. I not only give my hard earned cash to others outside of church, but I realize that “giving myself” doesn’t always have to be related to money. Giving my time can be appreciated just as well since people have told me. Helping my co-workers with a project can be satisfying. Also, most of the people I encounter on a daily basis tend not reflect on life, until something major hits them personally. However, my daily conversations are imbued with ideas and thoughts that many have said they do not think about, and they enjoy our discussions. I love this universal connection, makes me feel very alive. “Giving myself” in terms of money as well as ideas have made me a cheerful giver indeed. This is not to say I don’t have boundaries. I DO! But this is why I give not reluctantly or under compulsion—a true lesson I have learnt outside my once limiting thinking. I’m also glad you brought up the point about money. In the Six Seconds Model, when we talk about Give Yourself, it’s really not about a transaction — you give YOU. It’s about energy and commitment. Personally, I find it a lot easier to give money or material gifts than to give of my time. I guess the point is that, it is more difficult to give things that we value more. And yet, perhaps, the reason that we are here on this planet is to give of what we value more. Perhaps true selflessness is realizing that the THING I value should never be more important than the PERSON I need to value! Thank you for such insightful comment. It felt like a truth although I couldn’t get it on my own. The give yourself must be about this too. Josh, you will never stop surprising me! Brilliant! support for the worth of this diagnostic. Recently I have been doing pro-bono work for the adult children of friends. These young men have been impacted by the economy and for the first time in their life have found themselves questioning their worth. The Six Seconds model is a wonderful way to reground them in their self worth. This article really impressed me because of the profundity of the thought and the depth of the message. Helping others should not be an extra curricular activity. In fact it should be an integral part of our routines , for if we don’t help those in need, we are not living but merely surviving this modern life which is nothing short of a perpetual war . A war against time ,for money , power , guided by envy jealousy and certain misplaced disappointments and aspirations which per se shall never give us happiness. This is because happiness is completely independent of what we think is important to get it. Most of the times all those acts which are meant to bring smiles on the faces of others automatically lend us an equally effective reason to live and live joyously, giving us all the positive energy we require to further spread the smiles and set the ball of positivity in motion. This is quite challenging, its quite clear why those hell bound at acquring wealth at all costs can never be happy. your article has been an eye opener to me.it is clear one needs to understand himself very well and have a clear purpose in life and like you said these things can be better reflected upon when written down. Emotional Intelligence is an integral part of day to day life,The most important factor is connection, which can bring change. The process of giving is very intense to get fulfillment.I am of the opinion that life is like mirror,the amount you give it reflects back with more positive vibes.It strengthens inner qualities and makes a person more stronger to deliver output effectively. When we deal with large group with various age group in that case EMOTIONAL INTELLIGENCE works ,generates more happiness and sense of belongingness. Thanks for the article, it is very insightful. I am learning to listen to the significance of my daily routines at home and as well as at work. The thought that comes to me is ” I can give myself only as long as I have the opportunity of life. Hi Tim – or do I only have the opportunity of life when I give myself? You made me thinking again! Yes opportunity of life is found only in giving myself. To use a metaphor, only when the seed gives itself to the soil, life blossoms. I think in giving we find the purpose of life which is significance and fulfillment. I believe emotional awareness is a key to leading a happier and more fulfilling life. When we know how we feel we know what we enjoy doing and who we enjoy doing it with. We know who we feel safe with, who we feel accepted by and understood by. Thank you very much for the article, it is very helpful. I started to believe more on learning to listen to the though we might be able to lead a productive life, even a “successful” life, it is unlikely we will actually ever be happy unless we are very aware of our specific feelings. Giving for fullfillment is indeed the path towards happiness, growth and freedom in my opinion. However, some people give too much and really soccumb in this process. They end up consuming their energy in health in this. Others give to people and end up being taken advantage of. In my opinion it’s important to include oursleves in the giving: we give to ourself and to others, equally. When you’re out of balance and only in the “giving” zone, it may not be a sustainable balance. So, if we can KNOW ourselves better to see the balance, and CHOOSE intentionally, the whole system comes into harmony. Great Article and so well written! This Article had an unintended benefit for me personally. I always had a problem with the Six Seconds Model. This Article in fact cleared a fundamental doubt in my mind. Let me explain. 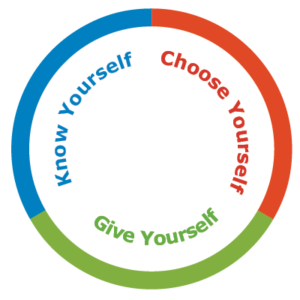 “Give Yourself” is on an entirely different plane compared to the other two dimensions in the Model – “Know Yourself” and “Choose Yourself”. One tends to give equal importance to all the three segments in the Model by sheer habit. After all, we are all programmed to be IQ driven. There is another reason too. The Model, the way it is depicted, appears to give equal weightage to all the three. ‘Give Yourself’ dimension is the overarching purpose whereas the other two are in a way means to achieve that end or at least help us to do so. Higher purpose and pursuing noble goals are achieved by ‘knowing’ and choosing’. Having redrawn the model mentally one conflict is off my mind and I am now able to appreciate the essence of what your Article is seeking to convey. This is equally true for the message emanating from Ted’s video. Now back to the Article. As usual it was brilliant. Keep up the good work. Hi Venkat – what you say makes sense to me. In some ways Know and Choose are “nice to have,” but Give is where transformation ignites… so it’s at a different “level.” Yet, we depict them in balance in our model because of the importance of the integrity that flows from inner harmony and balance. I’m working on this, not near mastery myself, but I can taste it some days. Pls see Slivia’s comment above and my reply for more on this theme. I appreciate you giving time to share these thoughts and to grapple with making the model “ring true” in your experience. And for the kudos – it means a lot to me. I had an experience that is very relevant to the topic of “Paradox of Giving.” A friend of mine celebrated her 50th B’day by having a fund raiser for an organization, Bay Area Wilderness Training (BAWT) that train leaders to take kids into the wilderness. She has been very contributing and helping this org and has signed up to climb Grand Teton as part of their fundraiser, “Climbing for Kids.” Many people contributed to this event. Owner/founder of “Growing up wild” gave the beautiful Redwood wilderness area to celebrate the event. People with various professions—Belly dancer, DJ, Tom Noddy (http://www.tomnoddy.com/), the bubble guy offered their show as a service to raise funds. He does magic with bubbles (see videos on the website). There was a belly dancer and other fun activities. She had a most wonderful celebration of her B’day that would have cost a couple of thousand dollars, which she cannot afford, by being a catalyst for BAWT’s fund raiser. What a wealthy person!!! I forgot to mention that it was a pot luck; with great food. Hi Shabbir – and, I suspect the energy created by this community sharing the ownership of creating the celebration has strengthened emotional bonds as well. I believe EI is an art form and not everyone has honed that skill. As I continue to make myself available to those in need and those that don’t realize they are in need, I show up everyday and greet the day with energy, love, and compassion. Thank you for what you bring to the world. I have completed my EQPC training in Jeddah KSA last week. I’m so much satisfied with this new (me), I’m appliying EQ everyday everywhere , I generate my husband,s and daughters brain profile and discuss with them there brain talent and glad that I was able to explain about brain,s profile. my husband is a deliverer and daughter is guardian, 10 of my friends are so much intressted to understand more after knowing about EQ. I shared with my family my knowledge of my EQPC training and willing to present a SEL workshop with my little babies of kindergarten and their teaches.already planing and working celebrating universal children’s day by using the provided stuff from six second.thank you six second to open the door of knowledge and there is so much more to discover. I believe that knowledge is a sea we need to dive in and get the pearls un counted and precious. we can make the world better by working together.